On weekends, North Smithfield Manor smells like freshly cut grass, as men venture out under the Alabama sun to tend to their lawns. Kids race their bikes up and down the neighborhood’s hilly streets. Leslie Williams, a 34-year-old mother of three, lives in her childhood home in this secluded subdivision, perched atop a ridge five miles north of downtown Birmingham. The neighborhood hasn’t changed much since Williams was growing up. She remembers riding her bike over the same hills, admiring the men with their lawn mowers, and hanging out in the small park that serves as the community’s heart. After her husband took a job that would keep him on the road most of the time, Williams moved back in with her parents in 2012 to save money. Her daughter, 12, and two sons, 11 and 10, started school, and Williams got a job in medical billing in Jasper, 30 minutes from Birmingham. The plan was for her children to follow in another longtime neighborhood tradition. Since 1971, a county school bus has arrived to take kids from North Smithfield Manor, a small pocket of suburban bliss built by black families who were blocked from buying homes in white subdivisions, to Gardendale High School, Williams’s alma mater, eight miles north. But if the white parents in Gardendale get their way, that 46-year-old tradition may come to an end. On May 16, the eve of the 63rd anniversary of the Supreme Court’s landmark Brown v. Board of Education school-segregation decision, Williams saw a post on Facebook shared by an old high-school friend she knew from her days playing trumpet in the Gardendale marching band: The newly empowered Gardendale Board of Education would be meeting in a few hours. Gardendale, a mostly white city 15 minutes north of Birmingham, had proposed separating from the Jefferson County School District, which encompasses Birmingham’s suburbs. 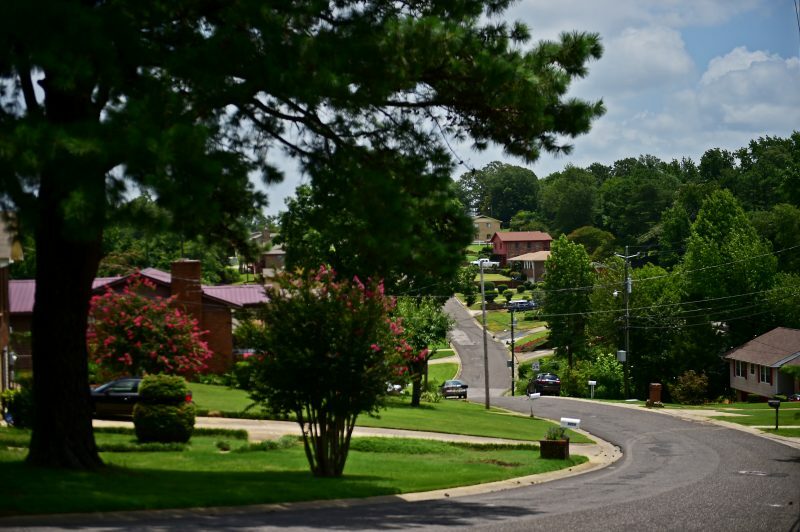 The majority of children living in Jefferson County’s increasingly diverse subdivisions are black and Latino; Gardendale’s new district would be about 80 percent white. The move had come to the attention of the federal judge overseeing a decades-old desegregation order that requires Jefferson County—once a front in the resistance against the Brown decision—to maintain racially integrated schools. Williams knew that she had to be there, so she asked her parents to watch the kids. 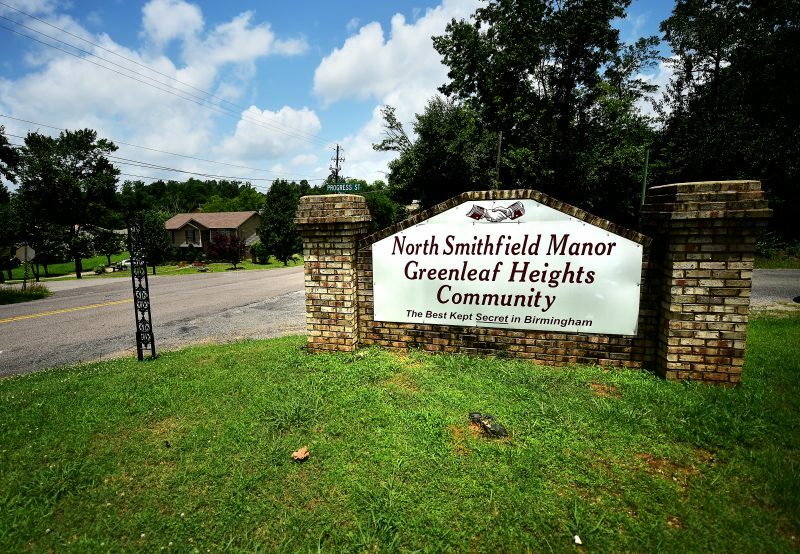 North Smithfield Manor has long been zoned for Gardendale schools as part of the district’s integration efforts, and Williams had planned her life around sending her children to Gardendale High, where more than seven out of 10 graduates enroll in college—one of the highest rates in the district. The majority-white city’s secession effort soon turned Williams into a reluctant community spokesperson. Williams is a woman with a strong, round face and prominent features, and she easily charms strangers with her warmth and wit. That night, she twisted her braided hair into a tight bun and put on black slacks and a black-and-white cardigan, then headed out the door to fight the rush-hour traffic. When she arrived at Gardendale City Hall, there was only standing room left in the large, mahogany-paneled hearing room. One of just a handful of black attendees, Williams walked past police officers and walls decorated with photos of the suburban city’s current and former elected officials, all of whom are white, to take an open spot along the wall. Six years into a parent-led campaign to break off from the Jefferson County School District, the Gardendale school board was meeting to discuss how it would set up the new district. Jefferson County’s desegregation order meant that Gardendale had been forced to get permission from the federal courts. Weeks earlier, the federal judge overseeing the case, Madeline Hughes Haikala, had approved the formation of the new school district. 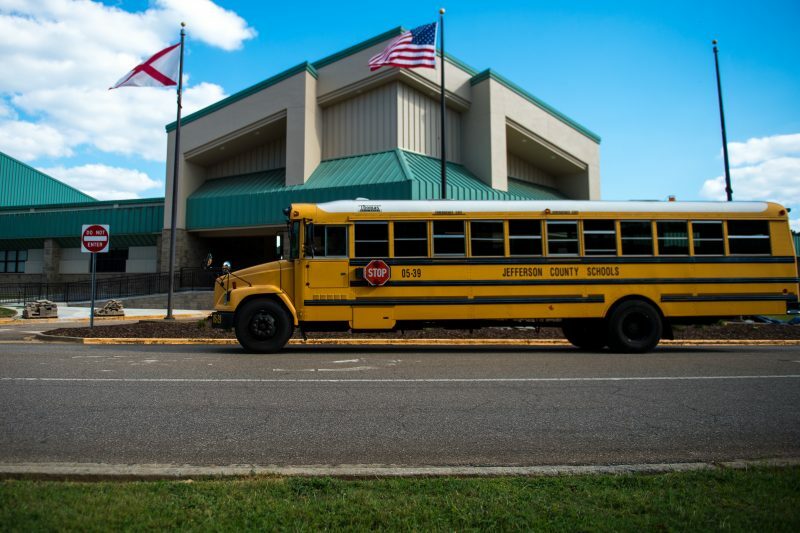 Haikala’s ruling meant that Gardendale could effectively wall itself off from Jefferson County’s schools. With their own separate district, Gardendale schools would be open only to Gardendale residents, instead of the much larger and more diverse swath of Jefferson County that they currently serve. Families in Williams’s virtually all-black neighborhood were set to lose access to the schools that have served their community for half a century. When she got to the front of the room, Williams faced the audience instead of the all-white school board and tried to level with them as parents. “I just want my kids to have the best opportunity, whether it be Jefferson County or whether it be Gardendale,” she said. “Like you, I just want my children to have the best. After the meeting ended, two parents approached Williams in the lobby. One mother tried to convince her that the separation effort had nothing to do with excluding black kids like hers. Looking back, Williams wishes she had made a different argument that night. It’s illegal to form a school district with the purpose of excluding people because of their race. Yet over the years, Jefferson County’s white residents have been allowed to carve out half a dozen exclusive enclaves. In 1954, when the Supreme Court handed down its landmark Brown ruling declaring that separate schools for black and white children were inherently unequal, there were five school districts in Jefferson County. In the 63 years since then, that number has more than doubled as white communities established new school districts separate from the increasingly black and Latino county district. If Gardendale succeeds, it would become the 13th school district in Jefferson County. While this kind of splintering has been going on across the country, what makes the Jefferson County case unique is the federal government’s power to stop it there. That’s because Jefferson County is one of just 176 school districts, out of the 13,500 across the nation, that are still under federal oversight to make sure they’re keeping their promise to fully eliminate all vestiges of Jim Crow. Yet six decades after Brown, federal judges and officials rarely check to see if districts are obeying their orders to desegregate—and in many cases, schools in districts with a history of discrimination against black children have actually grown more segregated under federal supervision. And when the judges do step in, they’ve often sided with the districts where school segregation is getting worse. Leslie Williams and the other parents who have fought these moves have been left wondering how the courts and the Justice Department could have so completely turned their backs on the vision of integrated schools first charted out by civil-rights lawyers and the courts in the 1950s and ’60s. “To separate [African-American children] from others of similar age and qualifications solely because of their race generates a feeling of inferiority as to their status in the community that may affect their hearts and minds in a way unlikely ever to be undone,” wrote Chief Justice Earl Warren in his Brown v. Board of Education opinion. Warren cited the work of black psychologists Kenneth and Mamie Clark. The husband-and-wife team used dolls to examine the effects of segregation on black children, finding evidence of internalized racism in the black children’s clear preference for the white dolls. Since then, the focus has turned to academic performance, usually as measured by test scores, and over the years even conservative scholars like Eric Hanushek, a fellow at the Hoover Institution at Stanford University, have found that segregation hurts children of color. Researchers have observed that while the racial test-score gap isn’t completely closed when schools are integrated, black students’ scores tend to go up when they’re in integrated environments. White children’s scores, meanwhile, aren’t affected either way by exposure to children of color. 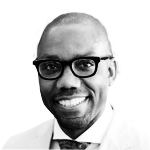 In his research, Rucker Johnson, an economist at the University of California, Berkeley, has looked beyond test scores. 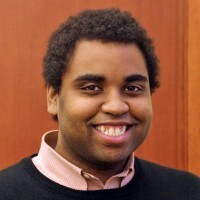 He’s found that white students who attend integrated schools have measurably less racial prejudice and tend to live in more integrated neighborhoods as adults. As for African Americans, Johnson has found that those who attended integrated schools earn more as adults, live longer, healthier lives, and even pass down these benefits to their children. In 2001, Williams graduated from Gardendale High and moved to Huntsville to attend Alabama A&M. By the time she returned in 2012, the county district had transformed from one in which white students made up almost 80 percent of the student body to one that primarily serves black and Latino children. The number of students from families with incomes low enough to qualify for federal lunch aid had increased from 27 percent to 56 percent. Every time a white community jettisoned the county district, they left behind an increasingly nonwhite and poorer student body and put more pressure on the remaining white communities to follow suit. When breakaway districts leave, they don’t only take students and school buildings with them; they also take tax revenue. 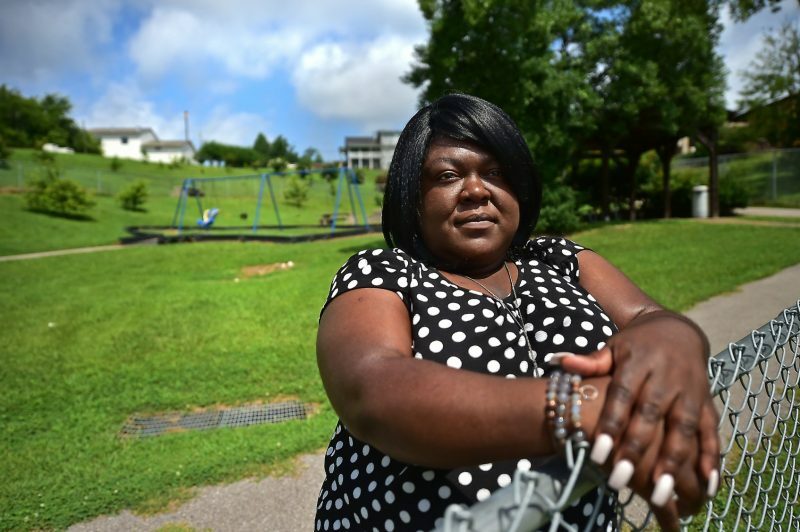 The state of affairs in sprawling, diverse Jefferson County is a case in point. In the early 2000s, two cities, Leeds and Trussville, with schools that were 62 and 87 percent white, respectively, left the county district to form their own majority-white school systems. After Trussville broke off in 2005, school officials there set about building the most expensive school ever constructed in Alabama: Hewitt-Trussville High School. The new district’s boundary lines are jagged: They include prized retail establishments and exclude modest neighborhoods and rental complexes like the Bentwood Apartments, a set of tidy two-story apartment buildings. The brick buildings are racially integrated, but the majority of families with school-age children are black. While Hewitt-Trussville is the closest public high school to the Bentwood Apartments, its doors are locked to the families there. Instead, Bentwood kids go to a county school that is farther away in the other direction—the very situation that prompted the Brown v. Board of Education decision more than 60 years ago. The nearby county high school is 66 percent black; Hewitt-Trussville is 81 percent white. Trussville officials did make sure to draw in the shopping malls, though. So when Bentwood residents go up to the main road to spend their money, their sales-tax dollars flow to the very schools they can’t use. When Williams decided to move back to Jefferson County, she inadvertently entered her family into a battle that is likely to be one of the last fronts in the long war for school desegregation. It’s a battle that black families and school integrationists are losing. Related: Can we trace the roots of Charlottesville to school segregation? Gardendale’s effort to break off from the Jefferson County School District has proceeded in fits and starts for decades now. According to U.W. Clemon, an attorney who represented black families in Stout v. Jefferson County, the desegregation case that covers Jefferson and all of its splinter districts, people in Gardendale have talked about splitting off since court-mandated desegregation started in 1971. “We’ve always had problems with Gardendale. It was a sundown town — blacks didn’t even buy gas there,” says Clemon, who grew up in Jefferson County. In 1995, the first year of readily available enrollment data in Alabama, 10 out of the 40 districts under continuous court supervision had demographics that would have allowed them to integrate, but instead chose to run 48 segregated schools. But the idea was taken up in earnest in the 1990s, after the city of Hoover became the first to break away from the Jefferson County district since the early ’70s. Scott Beason, a longtime state representative and senator, brought the idea out of Gardendale living rooms when he began talking about the split in the halls of the Capitol in Montgomery. Beason, a Gardendale resident, is one of Alabama’s most controversial figures. He was a driving force behind the state’s infamous 2011 immigration crackdown, which required police to inquire about the legal status of anyone they had a “reasonable suspicion” was in the country unlawfully. Beason has said that Republican lawmakers need to “empty the clip” on “illegal immigrants” or risk losing the state. In 2011, in a voting-rights case, a federal court found that Beason had displayed outright racial bias, citing, among other examples, the time he called black people “aborigines.” His “statements demonstrate a deep-seated racial animus,” the judge in the case wrote. The push for a separate Gardendale district fizzled out after two feasibility studies, the first in 1999 and another in 2005, both recommended against forming a new district. But two local dads revived the idea in 2011. David Salters is a father of four and a sales and operations director at a professional services firm. Born in Birmingham in 1972, just as white families began fleeing the city in large numbers, Salters has seen the long-lasting impact of white flight. His family moved to Morris, a working-class city in north Jefferson County. Salters graduated from a nearly all-white Mortimer Jordan High in 1991. He says the school wasn’t especially good: Less than half of his classmates went on to college after graduation. Salters himself spent 13 years working off and on trying to finish his bachelor’s degree. He eventually graduated from the University of Alabama at the age of 31. In his graduation photos, Salters is holding a baby—his oldest son—and posing with his dad, who didn’t complete high school. Since then, Salters has spent most of his career working in sales. ss departure of white families transformed into a majority-black suburb, now home to the district’s lowest-performing schools. In September 2012, Tim Bagwell, another dad, set up a Facebook group for Gardendale’s latest separation campaign. He added Lucas as an administrator, and Lucas added Salters. By October 2012, they had convinced the City Council to fund the third feasibility study in 13 years. The 2005 study had concluded that the cost of constructing a new high school was one of the barriers to forming a new district; but in the interim, the county had built a brand-new $55 million high school in Gardendale with money the district had raised from a countywide penny sales tax and new debt. The new Gardendale High School added 300,000 square feet to the existing building. The school now hosts a 650-seat performing-arts center, a 100-seat lecture hall, and two gyms: a 1,600-seat competition gym and a 300-seat practice gym. It also has a new baseball stadium, softball stadium, and practice fields. The author of the latest feasibility study—an expert who had been brought in by other splinter districts—agreed with that assessment. If Gardendale could separate and take the high school with it, the district would boast a brand-new facility with very little debt, a fact that the expert called “unprecedented” and “remarkable.” But the expert outlined one major hurdle still left: To pay for the new district, supporters would have to get residents in this conservative community to vote in favor of increasing their own taxes. A referendum was placed on the ballot for November 12, 2013. By then, Salters and the other dads had formalized the secession effort in an organization called FOCUS Gardendale, which they incorporated as a nonprofit to campaign for the property-tax increase. The group enlisted former state senator Beason to give them political advice. While Beason wasn’t out front in this push, he and his wife contributed money to FOCUS Gardendale, and his former campaign manager assisted the group. The campaigning worked. About 35 percent of Gardendale voters turned out for the special election and voted by a margin of 58–42 to approve the tax. After the vote, the City Council appointed the first members of the new Gardendale Board of Education. By June 2014, they had recruited Patrick Martin as the new superintendent. Martin, whose wife was moving to Birmingham to take a coaching job at the University of Alabama campus there, was recruited from a small district near Peoria, Illinois. When U.W. Clemon, the lawyer in the Stout case, deposed him, Martin testified that he had never hired a black teacher in his life. He had also never worked in a district that was more than 5 percent African-American. It would be Martin’s responsibility to come up with a desegregation plan that would have to include, among other things, a strategy for hiring more black teachers. At the same time, the new Gardendale school board went about negotiating a separation agreement with Jefferson County. When they were unable to agree on terms like a suitable price for the high school, they petitioned the state superintendent to mediate. During that time, Beason tried and failed to enlist the governor’s help. 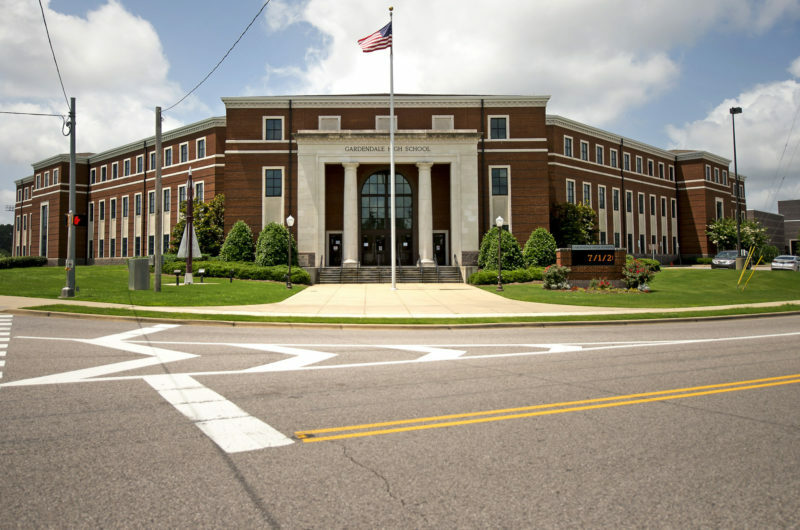 Eventually, the state superintendent sided with Gardendale and approved the split, but noted that the federal court overseeing Jefferson County’s desegregation case would have the final say. David Salters says this was the first time that Jefferson County had invoked the desegregation case. He thinks that county officials triggered the case as their last, best hope to keep Gardendale’s $55 million high school in the district. At the time, Salters didn’t think the desegregation case would be a barrier, because he and the other Gardendale parents had seen so many other cities leave county districts that were still under court order. In addition to Leeds and Trussville in Jefferson County, Pelham and Alabaster—two Birmingham suburbs in neighboring Shelby County—had recently been allowed to break away. Salters wonders where the NAACP’s Legal Defense Fund, the Justice Department, and the federal courts were when those splits happened uneventfully. Indeed, the Justice Department had given its blessing in all those cases, and the NAACP Legal Defense Fund even sided with Leeds and Trussville. But that was before U.W. Clemon returned to the case and breathed new life into the county’s desegregation fight. The assertion that the county’s current desegregation order, which was finalized in 1971, had become antiquated provoked a strong reaction from Judge Haikala. In contrast to the cases of Trussville and Leeds, when the Justice Department under George W. Bush stood on the sidelines, Barack Obama’s Justice Department came out against Gardendale leaving Jefferson County. Federal lawyers filed a brief calling for the courts to block the separation. Amy Berman, who worked on these cases under both the Bush and Obama administrations, says the Justice Department has actively opposed several of these splinter districts but has been unable to sway the courts, which make the final decision on them. Meanwhile, Clemon rounded up new plaintiffs for Jefferson County’s old desegregation case, mostly parents and grandparents from North Smithfield Manor, Leslie Williams’s neighborhood. Clemon, who grew up attending all-black Jefferson County schools, started fighting splinter districts after he graduated from Columbia Law School in 1968 and the NAACP Legal Defense Fund assigned him to Jefferson County. He was on the case until 1980, when President Jimmy Carter appointed him as a federal judge. Gardendale’s push to separate from the Jefferson County School District brought Clemon out of retirement, because he thinks it could prove to be a dangerous precedent. The South’s schools were once the most integrated in the country, thanks to the heavy hand of the federal government as it tried to force Southern districts to abide by Brown v. Board of Education. From 1968 to 1980, during the height of aggressive court supervision, the number of black students attending highly segregated schools in the South fell from almost 80 percent to a low of about 23 percent. But in the last three and a half decades, the number of black students attending segregated schools in the South has increased to nearly 36 percent. The federal government’s retreat is a main factor in the return of segregated schooling in the South. In 2000, there were 430 school districts under federal court order to desegregate, compared with 176 today. Without the feds watching, local school boards are prone to make decisions that end up separating kids by race. Even in places where the federal government is supposed to be paying attention, segregation is on the rise. Most of the 176 districts still under supervision are in the Deep South, the result of whole swaths of Alabama, Mississippi, and Georgia being put under supervision in statewide cases. But the rest are scattered across the United States and include places like Tucson, Arizona, and Waterbury, Connecticut. Out of that total, 69 have a student body diverse enough to run integrated schools, but local officials instead chose to operate “racially identifiable” or segregated campuses, according to a Hechinger Report analysis of enrollment data. Alabama is home to the most students attending school districts under federal supervision, and these schools follow the national pattern. In 1995, the first year of readily available enrollment data in Alabama, 10 out of the 40 districts under continuous court supervision had demographics that would have allowed them to integrate, but instead chose to run 48 segregated schools. Today, 12 districts that could integrate run 101 segregated schools that serve just over 54,000 children—an increase of almost 30,000 students. Last year, the Government Accountability Office issued a scathing report chiding the Justice Department for not even tracking basic details about the districts that remain under order. In 2014, Madeline Hughes Haikala, the judge overseeing many of the remaining desegregation cases in northern Alabama, including Gardendale’s, came to a similar conclusion while reviewing Huntsville’s 40-year-old desegregation case. Former Justice Department lawyers defend the department’s work, saying that both Democratic and Republican administrations have failed to adequately invest in making desegregation real. While Obama’s Justice Department racked up wins in dozens of cases, including a high-profile case in Cleveland, Mississippi, officials in many districts with segregated schools report that they hadn’t heard from either the Justice Department or the courts during Obama’s tenure. Many of the 176 outstanding cases have been in a state of suspended animation for years, if not decades. While the original court-mandated desegregation plans usually required districts to provide reports on a semi-annual basis, many districts don’t bother. Officials in several districts contacted by The Hechinger Report said that they hadn’t heard from the Justice Department or the courts in 20 years. One former high-level figure in Obama’s Justice Department said that during the federal hiring freeze that took hold in 2011, the department’s Educational Opportunities Section, which not only oversees all of the school-desegregation cases but also other cases involving equal access to quality education, had only a dozen or so lawyers handling the section’s 350 cases. (The Justice Department declined to confirm the number of cases.) According to one former official from Obama’s Justice Department, it simply didn’t have the manpower to actively oversee every district still under order, so it relied instead on community members and activists on the ground to bring the department’s attention to problem spots. That strategy put the onus to fight for integrated schools on some of the country’s most historically marginalized communities. Lawyers inside and outside of the Justice Department say the department’s attorneys must be cautious. Over the last two decades, judges and case law have become increasingly hostile to those seeking to compel districts to desegregate their schools. The precedent was set in 1991, when the Supreme Court ruled in the case of Board of Education of Oklahoma City v. Dowell that lower-court judges should dissolve desegregation plans if they believed that the districts had accomplished as much integration as was feasible. That ruling has provided an easy out for many districts. Since 2000, more than 250 districts overseen by the Justice Department have been declared “unitary,” meaning they’ve done all that’s “feasible” to eliminate their Jim Crow systems, leaving the Justice Department almost no power to tackle inequalities in those communities. The next few years may well prove to be the last in the federal effort to desegregate schools. Donald Trump’s presidency could provide the final blow. During George W. Bush’s administration, almost 200 districts shed their court orders. With just 176 districts left, Trump’s Justice Department could bring an end to the 63-year-old effort to erase the legacy of Jim Crow in the American education system, at a time when nearly 8.4 million black and Latino children are learning in segregated and high-poverty schools. The Justice Department failed to respond to multiple requests for comment. Leslie Williams says she’s torn about all of this. Before going to Gardendale High School, she attended an all-black Christian school run by a neighbor. She doesn’t think there’s necessarily anything wrong with an all-black school, but she would like her three children to be exposed to people from different kinds of backgrounds, just as she was at Gardendale High—the kind of education that is quickly disappearing across the South. Williams wants them to be in a place where they won’t feel pressure to fit into any box—where her daughter, who plays alto saxophone, her sports-loving middle son and her science-loving younger son can explore their interests. After the desegregation issue was raised, Gardendale had to change course. The district as originally proposed was intended only for Gardendale residents, but once desegregation came up, the organizers decided to add students from North Smithfield Manor. In new court filings, the district proposed allowing them to attend school there “indefinitely,” although the mostly black suburb wouldn’t be formally included in the district’s boundaries. Legally, Gardendale can’t annex North Smithfield Manor and make it part of the city, because the two communities aren’t contiguous. So the arrangement would be tenuous. North Smithfield Manor parents couldn’t vote in school-board elections and wouldn’t have a say in how the district was run. And when Gardendale’s desegregation order is dissolved, nothing would stop the district from dropping the neighborhood. Salters insists that his Facebook posts were taken out of context and that his campaign to create a new school district was driven by his desire to improve the quality of education, rather than to exclude children from outside of Gardendale. He adds that residents in the conservative community wouldn’t have voted to increase their taxes if they didn’t think there were real problems with how the schools were being run. Haikala, an Obama appointee, has been tougher on school districts than almost any judge in decades. But in the end, that didn’t mean much. In April, she ruled that Gardendale could break away. Gardendale would start with two elementary schools and would have to work in “good faith” to earn the middle and high schools. She also eliminated from the proposed new district North Smithfield Manor and the other outlying white communities, which would have enjoyed a 13-year grandfathering period, arguing that this only created more uncertainty for Jefferson County’s desegregation efforts. Haikala said she ultimately sided with Gardendale because she understood the merits of local control and because she feared that black kids in Gardendale would be targeted if she ruled against the white residents. But the alternative may prove worse for black families. When Leslie Williams moved back to North Smithfield Manor in 2012, it was a good bet: The Gardendale schools have served families from North Smithfield relatively well. According to a report done by the Justice Department’s education expert, Gardendale High enrolls more of its black students in Advanced Placement courses than the three high schools where North Smithfield Manor families may eventually end up sending their children. At Gardendale, which offers 12 AP classes, a quarter of black students enroll in at least one of those courses. Fultondale High and Center Point High, where North Smithfield Manor students could be transferred, offer only six AP courses, and just 8 percent of black students enroll in them. Indeed, the majority of Center Point students who go on to attend an Alabama public college have to take remedial courses to catch up to their peers. Both Gardendale and the black families contesting its secession effort have filed appeals, which means Gardendale city schools won’t start up this fall as planned. The Justice Department, now led by Trump appointee Jeff Sessions, has yet to weigh in on the case. Few places under the Justice Department’s watch have been as bold as Gardendale. In the other 175 districts under court order to desegregate, the process of abandoning Brown’s mandate has been much quieter and more complicated, if no less harmful to the students living there. Pickens County, Alabama, a rural school district 80 miles west of Birmingham, is one of those places still on the Justice Department’s docket where integration has eroded slowly, with little notice from the feds. Pickens County forms the northern tip of the Alabama Black Belt, a reference both to the dark, fertile soils that once supported a thriving cotton-plantation economy and to the people who live there. To this day, the county is home to far more black residents than communities just to the north, which are nearly all-white. Today, timberland accounts for most of the county’s acreage, and trucks stacked with freshly cut logs roar up and down the county’s two-lane highways. Pickens County is also home to over 500 working farms, and together agriculture and forestry provide nearly half of the jobs. Little has changed there in the last half-century, except for the schools. Pickens County was drawn into a statewide lawsuit responding to Governor George Wallace’s notorious campaign to keep black and white students segregated. Black plaintiffs in Macon County, Alabama, won a federal court case that allowed black students to be admitted to the all-white Tuskegee High School in 1963; in response, Wallace sent the National Guard to block the school’s doors. When that plan failed, he ordered that Tuskegee High be closed and white parents reimbursed for sending their children to a new all-white private school. Wallace’s plan backfired: By so blatantly using the state government to keep schools segregated, he opened the door for Alabama to become the only state in which all public schools had to submit to federal supervision. Alabama districts that weren’t already under their own desegregation orders became defendants in the Lee v. Macon case. At first, Pickens County tried a so-called freedom-of-choice plan, in which families could choose a different school from the one their child attended. During the first year of court-ordered desegregation, the 1967–68 school year, fewer than 1 percent of the county’s black students chose to move to one of the white schools. By the 1969–70 school year, 16 percent of black children attended those schools, yet not a single white family had chosen to leave a historically white campus. In 1968, the Supreme Court ruled that choice plans didn’t fulfill the promise of Brown. Districts across the country were forced to devise new plans for meaningful integration. In 1969, a federal court finalized a new plan for Pickens County, forcing it to merge its dual system of white and black schools. At the time, the district was 54 percent black. The court created four sets of schools. Under the court’s original plan, the demographics of each cluster ranged from 25 percent black, in Gordo, to 72 percent black, in Aliceville. But in the last couple of decades, the schools in Pickens County have become increasingly segregated. From the beginning, Pickens County officials undermined the new desegregation plan. For decades, they allowed white students zoned to majority-black schools to quietly transfer to other schools both inside and outside the county. In 1989, black residents of Pickens County sidestepped the Justice Department and filed a complaint with the US Department of Education’s Office for Civil Rights. The office found that the district had indeed been using transfers to allow white students to escape majority-black schools. While the district didn’t admit to improper transfers, it agreed to tighten up its transfer policies. A 1994 court agreement required Pickens County to deny transfer requests that would hinder desegregation efforts, although there were a number of exceptions—for example, families could get a transfer if they established that a school placement jeopardized a child’s health or safety. But the rampant transfers continued unabated. In 1998, in its reports to the court, the district acknowledged granting 123 transfers that year. A third of those transfers were for white students to leave Aliceville schools, where just six white students remained. The pattern continued for years, until the Justice Department reached out to the district in the early 2000s. But by 2003, the damage had already been done. In Carrollton, the small county seat, the elementary and high schools so struggled to keep up white enrollment that in 2006, Pickens County asked the Justice Department and the federal courts to let it close all of the town’s schools. The Justice Department sided with county officials. In justifying their decision, the department’s lawyers made a point of noting that a black superintendent introduced the plan to close the predominantly black schools. Today, the remaining schools in Pickens County are a picture of the half-hearted progress that the nation has made toward ending its legacy of racial segregation. Two schools in the county remain integrated: In the town of Reform, an elementary school and high school have student populations that are close to the overall makeup of the district. But over 80 percent of the district’s white students attend Gordo schools, where white students make up 64 percent of the population. More than half of the district’s black students go to school in Aliceville, where black students comprise 98 percent of the student body. 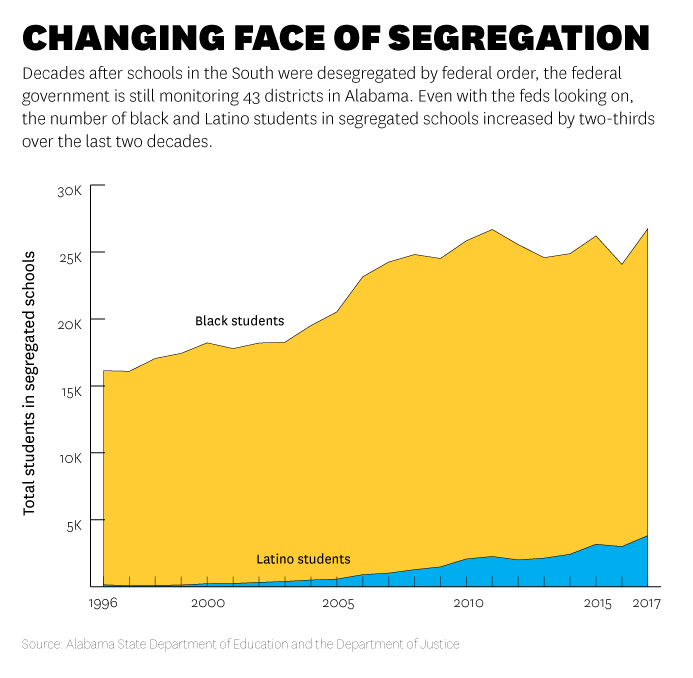 Similarly, across the 176 school districts still under order, black and Latino students are increasingly enrolled in schools that don’t reflect their district’s racial makeup. When demographics in a school vary from the district’s overall numbers by more than 20 percentage points—for example, a school that is 60 percent black in a district that’s only 35 percent black—experts call these schools “racially identifiable.” They say these numbers signal that a district could do more to integrate. In Pickens County, five out of the seven schools are racially identifiable. And looking at all of the 40 Alabama districts the federal government has been overseeing for decades, there are 125 racially identifiable schools today, up from 72 in 1995. Today, almost 64,000 Alabama children attend such schools, despite being enrolled in districts under court order to desegregate. While there was talk in the early 1990s about consolidating Pickens County schools—two of the county’s three high schools serve just about 275 kids, and Gordo serves 550 students—that idea was quickly quashed by vocal opposition from white parents in Gordo. No one believes that integration is really a possibility in Pickens County anymore, despite the desegregation order that’s supposed to dictate how schools are run in the district. Instead, officials and many local residents are in agreement that the focus should be on improving the quality of education for black students. The court approved a new “desegregation” plan in 2011. It focuses on eliminating disparities between black and white students in a variety of areas, including graduation rates, suspensions and exclusions, scholarships, and enrollment in advanced courses like honors and AP classes. Vanessa Anthony, the district’s associate superintendent and a graduate of Aliceville High School, thinks Lee v. Macon helped the district. “Like with No Child Left Behind forcing us to report out how different groups were doing, the Lee v. Macon case has forced us to look at how everyone is doing, not just the top performers,” says Anthony, who is black. But she also notes that Pickens County has bigger concerns than making sure students are evenly distributed by race across the district’s schools. It’s hard to get teachers to stay in a rural district with few amenities, and students are moving away too, making it difficult to provide a high-quality education for anyone, Anthony says. In the end, school officials in Pickens County are hoping they will somehow be able to make separate equal. So far, however, making separate equal isn’t working out very well in the segregated schools that the Justice Department oversees in Alabama and elsewhere. Alabama’s data show a relatively strong correlation between segregation and failure, and between integration and success. In Clinton, Mississippi, a suburb of Jackson, the public schools are 53 percent black and 39 percent white. In response to a desegregation order, the district reconfigured its schools to provide a single school for kindergarten and first grade, another for second and third grade, and so on. The plan allows the district’s students to attend school together, ensuring that each school reflects the district’s overall racial and socioeconomic makeup. Over the years, even as poverty has increased in the district, the schools have continued to serve both black and white students well. Though there’s still a gap in performance between the two groups, Clinton is the only majority-black school district in Mississippi that gets an A on the state’s rating system. Erica Frankenberg, an education professor at Pennsylvania State University, says that integration has a proven track record, but that the fight for securing and maintaining integrated schools has taken a toll even on some of its fiercest proponents. Amy Berman started at the Justice Department in 2002 and spent nine years working on school-desegregation cases under the administrations of both George W. Bush and Barack Obama. After Bush took office, the department began a comprehensive review of its 430 remaining school-desegregation cases, planning to lift orders in as many districts as possible. During that period, federal courts closed out almost 200 cases, including in places like Vestavia Hills, Alabama, where the immediate impact was a return to segregated schools after the district dropped the black neighborhood it had been forced to serve. According to Berman, the approach was starkly different under Obama. While she says the career attorneys working under both administrations often fought vigorously against resegregation, Berman admits that there was a shift in policy under Obama. Rather than helping the districts that requested to dissolve their cases, the Obama administration imposed consent decrees, which required these districts to lay out a plan to address, under court supervision, the lingering disparities between black and white students. This summer, the Justice Department under President Trump reversed course from the Obama administration’s policy and said that it would allow Franklin County, Mississippi, to end its court supervision without a consent decree. With Trump in office, it’s probably only a matter of time before the number of federal desegregation orders drops again, possibly to zero. Trump’s team is opposed to using consent decrees to keep the pressure on school districts and make sure they’ve fulfilled their promise to erase the legacy of Jim Crow, arguing that the courts and the Justice Department need to get out of these local matters. Berman and other civil-rights lawyers say they’ve already heard rumors of districts gearing up to ask the courts to lift their orders, assuming the Trump administration won’t fight them. Meanwhile, the resegregation of the South could soon accelerate. Both Alabama and Mississippi, which together are home to nearly half of the remaining cases, have recently passed laws allowing for charter schools. 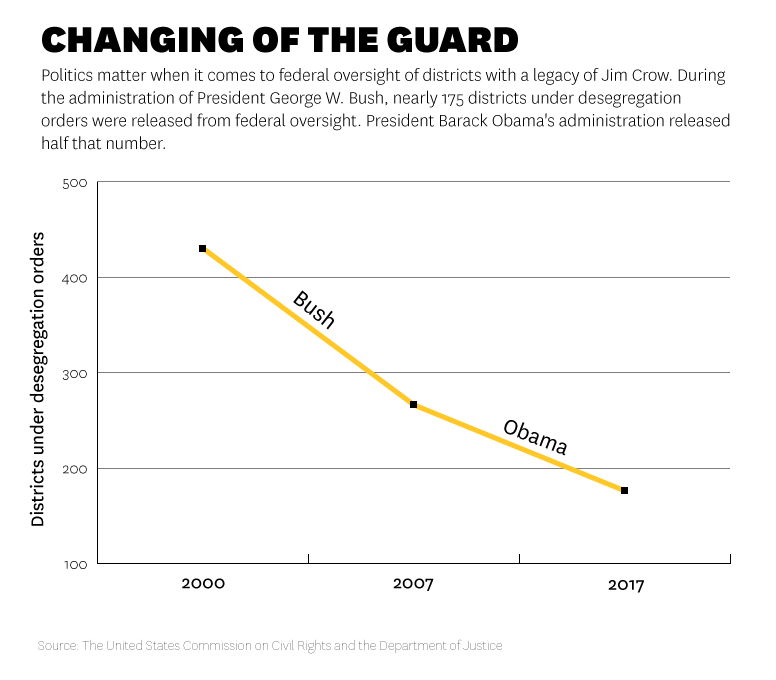 Frankenberg and other researchers have found that charters tend to increase segregation. The case of Mitchell County, Georgia, is a cautionary tale. In the late 1990s, a group of white residents in Mitchell County used Georgia’s nascent charter law to start a new school, which opened in 2000. Once that happened, white families peeled off from the nearly all-black district schools to which they were zoned and enrolled at the Baconton Community Charter School. The federal court overseeing Mitchell County’s still-active school-desegregation order didn’t interfere. While diversity has increased significantly at Baconton since then, the charter school is still 74 percent white, while the district schools are only 8 percent white. “We have 26 percent students of color, and we do have a plan in place to attract more students of color,” said Baconton assistant principal Mary Sullivan in an e-mail. The final retreat of the federal government from its responsibility to enforce the Brown decision will send a clear message to places like Gardendale. “If you can create a school system with racially inspired motivations, there is nothing stopping the return of segregation,” says U.W. Clemon, the civil-rights attorney and former judge. Thank you, thank you, thank you. This is an EXCELLENT piece of reporting on a very complicated historical mess. It is also done with empathy as well as diplomacy even though anger and disgust would be appropriate. While this segregation is happening in the South, other parts of the country have this same segregation based on race and economics. State and national education officials bemoan the achievement gap but do not call out the root cause of the problem.